Liverpool FC: Two games in, what have we learned? 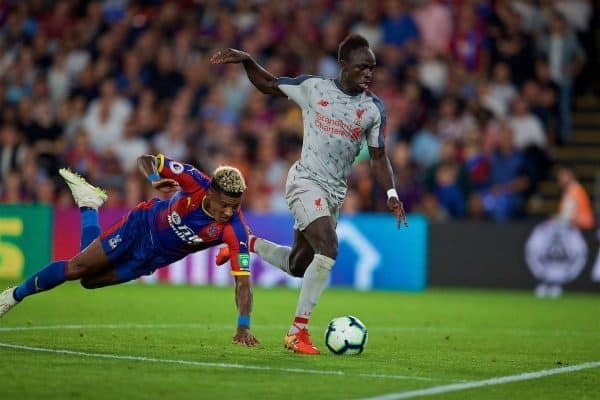 The start to the new season has been excellent, writes Alex Malone, and it’s time the defence started to get as much attention as the attack. Ok, let’s get the ‘it’s onlys’ out of the way first. It was only West Ham, it was only Crystal Palace, and it’s only two games into the new season. There you go…done. But this feels different, doesn’t it? Everything about these two wins feels like a precursor, a prelude to great times ahead. It’s all too easy to say, ‘well, it was only West Ham,’ but this was a team who had invested £100 million on new players and who had brought in a Premier League-winning manager. None of the pre-game press talked about us swatting them aside in the manner we did. And, yes, greater tests lie ahead than Crystal Palace. But this was a Crystal Palace unbeaten in their last seven Premier League games (since we last beat them) in which they had scored no fewer than 16 times. This was a team that was playing their first home game of the season after a very impressive away win, and with one of England’s most vociferous crowds roaring on their every kick. 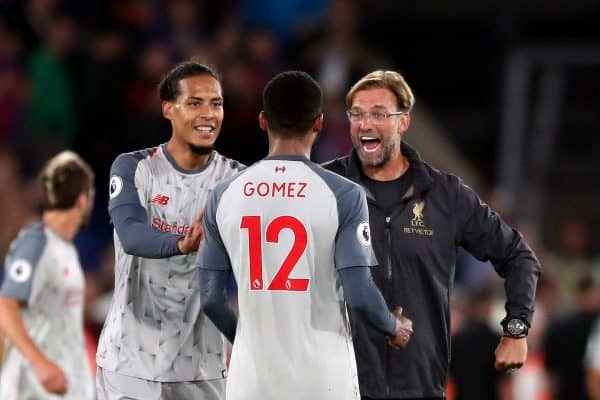 Let’s not forget, too, that these were the home and away debuts of our new goalkeeper and central midfielder, and the first time we’ve competitively seen the Van Dijk-Gomez partnership in a re-shaped defence. We hadn’t yet won our opening two league games under Jurgen’s watch. Now we have. As spectacular as our attacking football has been, it’s no secret that Liverpool’s back four has been our Achilles heel for several seasons now. Our ‘first-choice’ defence, whichever five we picked, were simply not good enough and were consistently undermining the excellent work further up the field. None of Martin Skrtel, Simon Mignolet, Loris Karius, Alberto Moreno, Ragnar Klavan, Dejan Lovren or Joel Matip offered any level of consistency. Those days are behind us. Finally, we have a top-class goalkeeper and a genuinely talented, dependable, solid, organised defence; a back five where mistakes will be the exception, not the rule. Alisson’s two performances to date have been quite extraordinary. In all my many years of watching this great club, never have I seen a goalkeeper distribute the ball like this. Many will (rightly) claim the great Ray Clemence as Liverpool’s greatest ever ‘keeper. He was…at shot stopping and commanding his area. But he kicked the ball out under pressure like my Aunty Mary. In just two games, Alisson has shown just about every positive trait a goalkeeper can. Against West Ham, he had the freedom of Anfield to ping laser-like passes to whomever he chose. Against Palace, he really had to earn his crust. 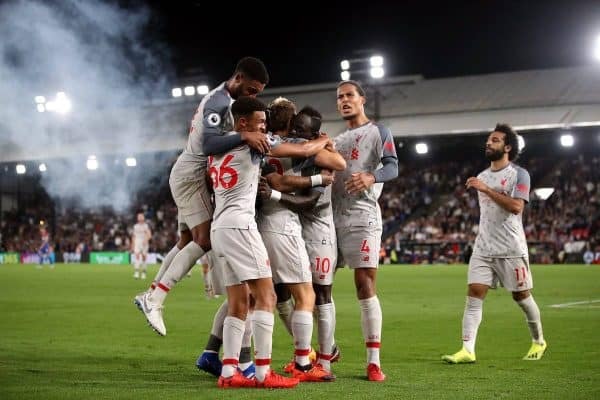 A fabulous, athletic, free-kick save was supplemented by excellent positioning for a Benteke header and a Zaha drive through a cluster of bodies, and supreme command when coming for crosses—catching rather than punching. Too many modern keepers seem to lack confidence in their own ability to catch when under even a glimmer of pressure, far too often opting to punch when catching is the better option. Invariably, when a keeper chooses to punch, the ball lands back at the opposition’s feet, inviting further pressure. How many times have we conceded in recent seasons as a result of failing to deal with second and third balls? Catch it, and you regain possession and control of the ball. Finally, we have a keeper capable of doing so. Take a look at a few stats to further highlight the improvement compared to the recent past. What made Monday’s defensive display even more impressive was that this is the kind of attack against which we have all too often been found wanting. An aggressive, bulky target man, flanked by speedy wide men, has too often resulted in defensive capitulation. 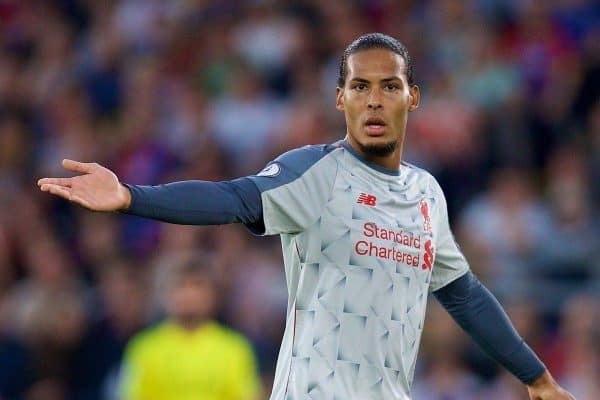 Virgil Van Dijk’s performances since joining have been stunning and the Palace game might just be his best yet. Benteke didn’t get a sniff. In addition, he has improved the performance level of every single partner he has had. 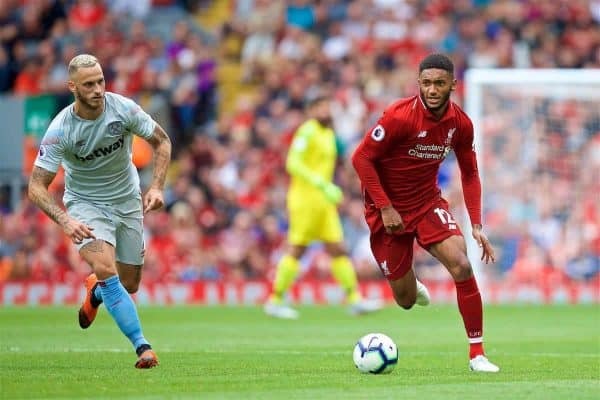 The latest example is Joe Gomez, at last given a run in his preferred centre-back position after a long stint as a decent, but never great, full-back. He’s been fantastic so far and Dejan Lovren may well have a real fight on his hands to regain the shirt. It’s also worth noting that winning 2-0 at Selhurst Park is no mean feat. In fact, no Liverpool team has kept a clean sheet in a league game there since 1997. That accolade went to David James, Steve Harkness, Bjorn Tore Kvarme, Dominic Matteo and Jamie Carragher! It was also just one clean sheet in 12 successive league games away at Palace. But it was not the law of averages that saw us get that elusive second on Monday; it was a supremely well-organised back four, combined with a top-class goalkeeper. Klopp’s construction of this back five is very much in keeping with his meticulous planning and methodical approach. It is made up of two world-class, world-record signings, supplemented with a £10m left-back from relegated Hull City, a 20-year old originally brought in for £3.5m and an academy graduate. The latter three have all been made to bide their time, then impress when given the chance. Once you own the shirt under Jurgen, it’s yours to keep as long as your performances merit it. Get injured and you might not get it back…shades of a certain Bill Shankly perhaps? 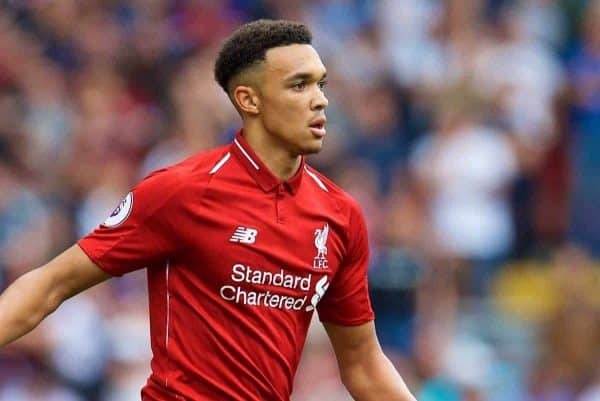 For several seasons prior to Van Dijk’s arrival and the emergence of Trent & Robertson as full-backs, we conceded an average of 1.2 goals per game. Just to clarify, that was for several seasons, going right back to the beginning of Brendan Rodgers’ reign, and continuing right up until January 2018. 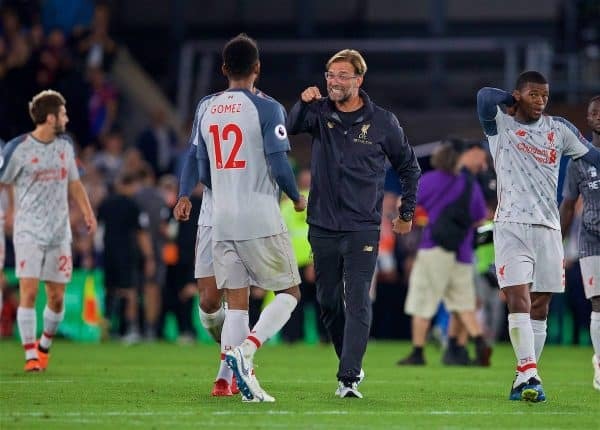 Jurgen Klopp has been branded, wrongly, as a manager who puts all of his tactical eggs in the ‘attacking football’ basket. Mediocre defensive records in his first two full seasons did nothing to dispel the myth. It is, however, patently untrue. In his two most recent appointments at Dortmund and Liverpool, he took charge of two teams who were floundering. By his third season at Dortmund he had not only dramatically improved their goals scored record, but also their goals conceded. Klopp’s third season at Dortmund saw them concede an average of 0.65 goals per game, down from 1.2 per game in his second season. The same pattern is emerging at Liverpool. The defensive statistics mentioned above are the kinds of numbers that all great teams, all trophy winning teams, need to have. We all know that the attacking trio is already the envy of Europe. Naby Keita and Xherdan Shaqiri have added creativity and vision to a midfield already boasting power, pace and grit. 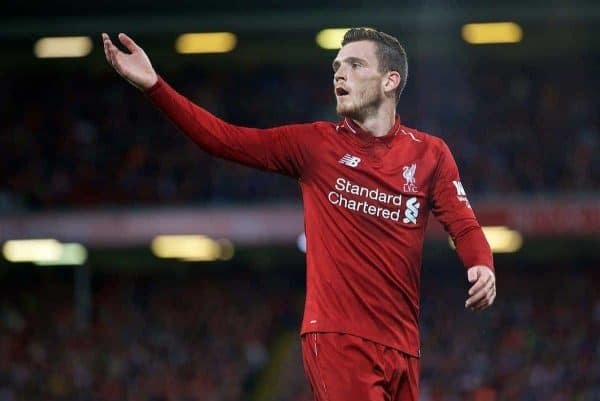 With the additions of Alisson and Van Dijk supplementing the excellence of Robertson, Trent and Gomez, the final pieces of Klopp’s vision are now well and truly in place.